At the Yugoslavia/Greece border they met some young people. One was from Australia, a guy named Peter, and a couple from England. The British man had lost his passport and the authorities weren’t going to let him out of the country. Since Peter was driving a small Austin Healey Sprite sports car and couldn’t accommodate another passenger, Dan and Mick offered to help. 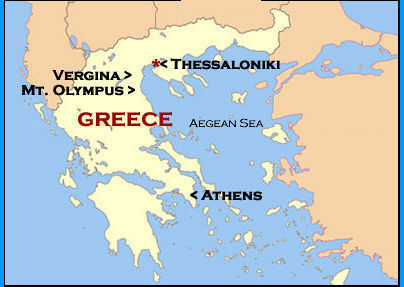 The plan was Peter would go through the border first and inform the border police on the Greek side of the situation. Then Dan and Mick would go through the border, the English couple would run and join them and they would all take off for Greece. That is exactly what they did. As soon as the gate opened to let the boys pass, the Brits ran and jumped into the back of the jeep and off they went with the Yugoslavian soldiers yelling and giving chase in their own vehicle. There was two or three kilometers of no-mans land between the two borders, so with the Greeks waving them on and the Slavs in hot pursuit they barrelled down the road just making it through the Greek border with the Slav soldiers slamming on their brakes to not crash into the now closed gate. The border police in Greece were allies of Britain and the U.S. so they got the young British couple straightened out. A little excitement to get the blood flowing! Peter ended up travelling with the boys for the next few months. That night they slept in a field with their vehicles parked by the side of the road. The sports car had a box on the trunk with a kangaroo painted on the box. In the morning they woke to three big Greek guys standing over them. They had been in the resistance during the war and an Australian submarine had rescued one of them off the Greek coast. When they saw the kangaroo they decided to bring a basket of fruit to say thanks. They spent most of the day with them, communicating through broken English, hand gestures and pantomime. Greece was lovely and the people friendly and kind, a sharp contrast to Yugoslavia. The Greek drachma on the black market was at three times the official exchange rate and food was ridiculously cheap. Coming from the north toward Thessaloniki they came to a nice sandy beach and set up camp. There was a family that had a tent set up 150 yards or so away and as they were swimming they met the beautiful young girl. She wanted them to meet her family and Dan asked if she wanted to go for a ride in the jeep. When he took the jeep over to pick her up that evening, her mom and dad came with her. 🙂 They toured the area ending up at the family farm where they met the sister who was married with a baby. She was a schoolteacher and spoke better English and she told Danny that her sister really liked him. The girl’s father told him that he wanted him to stay and work on the farm, and then he offered his daughter’s hand in marriage! This was after a day and a half! Danny was taken aback and didn’t know what to say, so he smiled and started to plan an escape! Back at the beach, after the Dad had a few drinks in celebration and had gone to bed for the night, the boys decided to do a runner. Around 2:00 a.m. Dan and Mick and Peter packed up their tent, pushed the vehicles off the beach and down the road to not wake anyone up. A couple hundred yards later they hopped in and took off. These Greeks were very friendly! it never ceases to make me laugh that they offered their daughters hand in marriage only after a day and a half of knowing Uncle Dan! Love reading about my family history like this, great job Mom!